Cleveland Fire Brigade has kicked-off the Christmas countdown with a reminder for people to take care with electrical goods during the festivities. The Brigade has linked-up with electrical retailers, phone shops, supermarkets and other electrical outlets to hand-out leaflets warning of the extra hazards. Figures show that electrical faults are one of the main causes of accidental fires at this time of year, when people have extra electricals in the home. Ranging from decorative lights and phone chargers to tablets, laptops and IPads and sockets can become overloaded. Retailers supporting the campaign include Argos store in Middlesbrough. The retailer was involved in a successful pilot scheme last year. 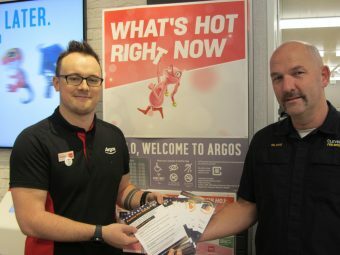 Steve Johnson, Area Manager, Prevention and Protection, Cleveland Fire Brigade, said: “The key message is Be Safe Not Sorry and we really appreciate the support of electrical retailers and other outlets getting this across to consumers by handing our leaflets with key tips on how to stay safe. “Checking wires and bulbs on decorative lighting, not overloading plugs and remembering to switch off appliances before going to bed or going out can prevent the heartache of a serious fire, injury or even save your life. “We would also warn people not to fall for cheap fakers and counterfeit goods. Electrical Safety First recently tested a range of fake chargers and found that 98% could cause a lethal electrical shock or start a fire”. The Brigade is also asking people to support REGISTER MY appliance. The scheme has been developed by the Association of Manufactures of Domestic Appliances and encourages householders to register fridges, freezers and washing machines so they can be contacted quickly if a recall or free sfary repair is needed. The scheme also applies to some second hand goods.